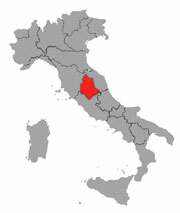 Umbria is one of the smallest Italian regions, sandwiched between Tuscany, the Marches and Lazio, at the center of Italy. Actually, the exact geographical centre of the Italian peninsula can be found near the town of Narni. It is also the only one that is entirely landlocked, with neither a coastline nor an international border. 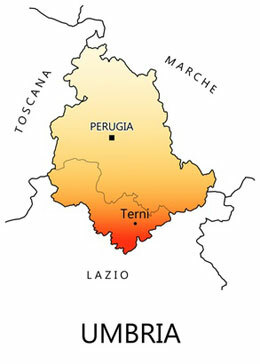 The capital of Umbria is Perugia. With its rich history and the natural beauty of its landscape it is a natural destination for travelers seeking peace and quiet with plenty of opportunities to tour around and visit historical sites. The climate in Umbria could be described as either Continental or Mediterranean - as it is generally warm and dry in summer and mildly cold in winter. The June to September period in Umbria is characterized by a steady dry and slightly warm weather with clear skies. 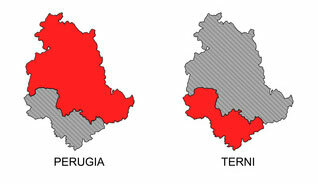 Generally, it is rare to experience rainfall in Umbria except during the Autumn and generally the rain is concentrated more in the Eastern region. Air in Umbria is remarkable in that it is non-humid and non-polluted all the months of the year. Marmore Waterfalls: see also The Green Hills of Umbria. Spello: a picturesque, little town and one of the most interesting towns in Umbria, offering one of the most beautiful and breathtaking views from a natural and urban point of view. The village is also famous for its Flower Festival (Le infiorate del Corpus Domini) held on the Feast of Corpus Christi. see also 5 charming little towns in ancient Umbria. Norcia: see also The Green Hills of Umbria. Gubbio: Gubbio is one of the most ancient towns of Umbria, extremely well preserved throughout the centuries and rich of monuments testifying its glorious past. The summer months of June to August can get very hot and humid, therefore the best times to visit are the spring and autumn months of April & May, and mid-September and October, when the temperatures are milder. The International Jazz festival of Perugia is held in July so this can be an expensive time to visit. Another famous music festival is the Festival dei Due Mondi, of Spoleto. (See further). November is the wettest month with around 4 inches (100mm) and July is the driest month with around 1 to 2 inch (25 to 50mm). From Perugia: chocolate. Perugia is considered the capital of chocolate in Italy and the yearly Chocolate Fair of Perugia, known as Eurochocolate, is renowned all of Italy. An annual event dedicated to the combination of music and food. The Mercato delle Gaite is a big summer festival with medieval banquettes, processions, challenges between the four gaite (quarters) and taverns. For two weeks tourists have the opportunity to penetrate the narrow streets and medieval shops and travel back in history among the fumes and flavors of medieval times. Festival of the Two Worlds, a mix of cultures, experiences and tales from around the world. The "Festival Dei Due Mondi" has a run down of concerts, dramatic operas, impressive visual arts and a mind joggling discussions about Science. One of the most significant jazz festivals worldwide. Held between July 9- 18, this event has become a prestigious gathering of famous names in jazz. With the night of the ministrels, the procession of the lumen and the historical parade of the banner the village relives the glory of Renaissance. The city is known locally as the "Costruttori di dolcezze, or a designer of sweet things. Pietro Vannucci, the famous painter nicknamed Perugino, was a native of Città della Pieve near Perugia. He was the teacher of Raphael and decorated the local Sala del Cambio with a beautiful series of frescoes; eight of his pictures can also be admired in the National Gallery of Umbria. Pinturicchio, another famous painter, lived in Perugia. Galeazzo Alessi is a famous architect from Perugia. San Francesco di Assisi, patron saint of Italy. Erasmo of Narni (1370 - 1443), better known as "Gattamelata" ("The Honeyed Cat"), was among the most famous of the condottieri or mercenaries in the Italian Renaissance. He was born in Narni. Matthew of Aquasparta (1240 - 1302) was an Italian Franciscan and scholastic philosopher, born in Acquasparta. Augusto Vera (1813 - 1885) was an Italian philosopher who followed Hegel's theories and translated many of his works. He was born in Amelia in the province of Terni. Monteleone di Spoleto is a town and comune of Italy, in the province of Perugia in southeast Umbria, overhanging the upper valley of the Corno River. It is one of the more remote towns in Umbria, on a mountain road from Norcia and Cascia to Leonessa and Rieti in the Lazio region. Umbria is named after the original inhabitants of the region the Umbri, an Italic people of ancient Italy. One of the most ancient etymological explanations is that Umbri derives from the Greek Ombrii ("a shower" or "rain" meaning "the people of the thunderstorm") because they were thought to have survived the deluge (literally "the inundation of the lands by thunderstorms, imbribus). Another explanation is that it derives from uber, referring to its fertile soil. Yet another explanation is that the word derives from the Gaelic Ambra or Amhra, which means valient or noble. 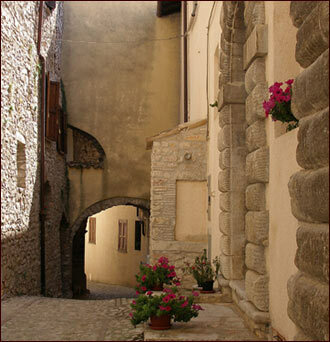 Assisi: see also 5 charming little towns in ancient Umbria. Spoleto: one of the main tourist centres of Umbria with international fame. see also 5 charming little towns in ancient Umbria. Todi: see also 5 charming little towns in ancient Umbria.